Alpha blending is a process of combining an image with the background to create an appearance of partial or full transparency. 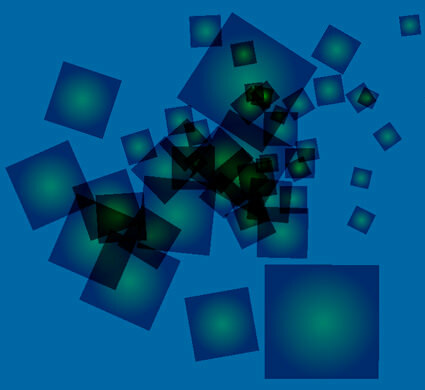 The ColorSrc corresponds to the polygon color (source image), and ColorDest corresponds to screen buffer color (destination image). The ColorRes is the resulting color. If a color has an Alpha component that equals to 0, it will be transparent. With Alpha value of 1, the Red, Green and Blue values are added to create a color. 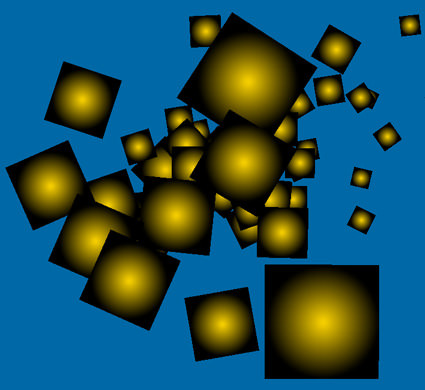 To compute the color in semitransparent areas, linear interpolation is used. As well as the Alpha component, RGB values are also normalized. bR, bG, bB, bA are normalized background red, green, blue, and alpha values correspondingly. Means there is no alpha blending for the material. The object is rendered completely opaque. Opaque (alpha = 1) areas receive material color. 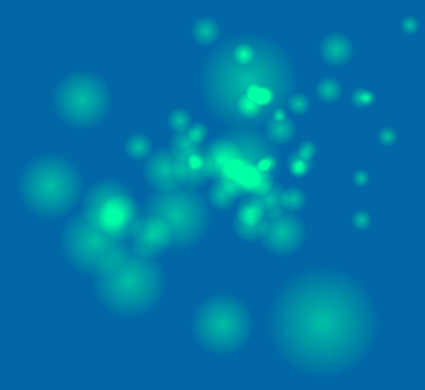 Transparent (alpha = 0) areas receive screen buffer color. The combination is used to create the effect of transparency basing on the alpha component. Opaque areas receive material color, but they are darker and smaller in size, if compared to the previous variant. The areas of alpha gradient fading are darkened. Transparent areas receive the screen buffer color. Opaque areas are also small and even darker and more contrast, if compared to the second and third variants. Opaque areas are small and of the inverted color. 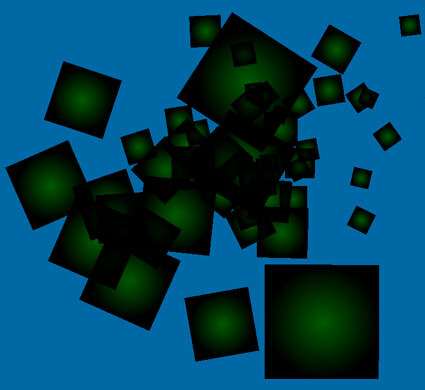 Completely black diffuse material color will result in rendering in screen buffer color. In overlapping opaque areas, the material color is added to itself. The areas are very small in size. Transparent areas receive screen buffer color. In overlapping opaque areas the material color is added to itself. The areas of alpha gradient fading are bright and distinct. This combination can be used to create halation, particles systems, and volume lights. In this blending mode, the darker the color of the object is, the more transparent it is visualized. By overlaying a lot of layers, overlighting occurs. Opaque areas receive screen buffer color multiplied by the material color. If all the material is semitransparent, this combination can be used to create the colored glass. With a non-white color, a completely opaque area seems small and receives the inverted color. In the area of alpha gradient fading, it changes into the summed color. Layers overlapping causes intensification of the color. 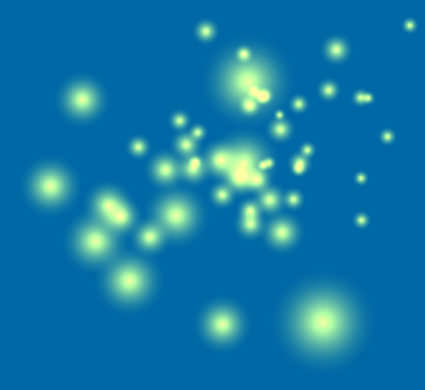 If the diffuse material color is white, completely opaque core areas receive screen buffer color that changes into the summed color as alpha gradient fades. Transparent areas are of the screen buffer color. 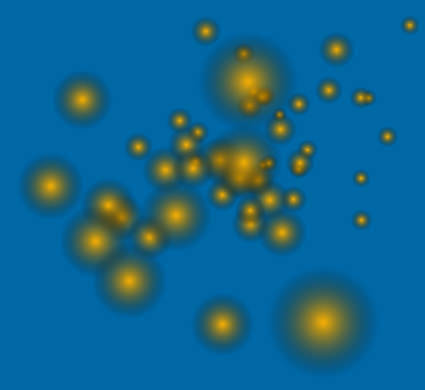 Changing the diffuse color multiplier changes the size of the core areas (ring size on the illustration). With a non-white color, a completely opaque area that receives the inverted color seems bigger in size and darker. In the area of alpha gradient fading, the material color appears dull, tint, and barely visible. If the diffuse material color is white, completely opaque core areas receive black color that changes into the summed inverted color as alpha gradient fades. Changing the diffuse color multiplier changes the size of core areas (ring size on the illustration). Opaque areas are bright and of diffuse material color hue. The darker the screen buffer color, the more saturated the material color is. In overlapping areas, inversion of the screen buffer color becomes more and more visible with increasing the number of layers. In overlapping areas, the color is changed from the inverted to the background color and back again. This combination is more suitable for materials of white or bright (of high value) diffuse colors. Otherwise, the material color tint is not visible. Opaque areas receive the summed color of material and screen buffer. 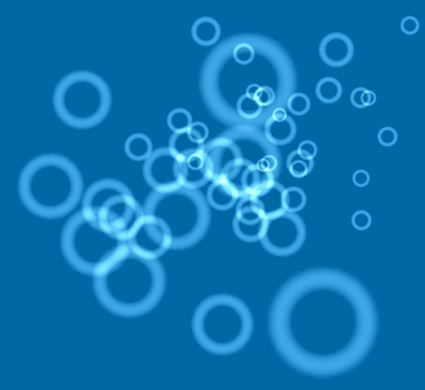 Transparent areas are of the multiplied screen color — darker and more saturated. In overlapping areas, the material color of both opaque and transparent (according to alpha component) areas is intensified.